In that story (issue 213, I think), there is a scene in which Hank is supposed to have accidentally struck Jan while throwing his hands up in despair and frustration–making a sort of “get away from me” gesture while not looking at her. Bob Hall, who had been taught by John Buscema to always go for the most extreme action, turned that into a right cross! 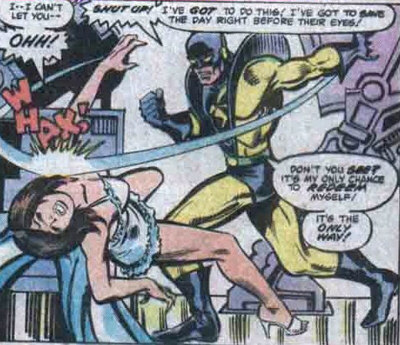 There was no time to have it redrawn, which, to this day has caused the tragic story of Hank Pym to be known as the “wife-beater” story.